I’ve been watching a little of the AMC series “Mad Men” and I am struck by how simple is the color palette of the man in the grey flannel suit. These guys look sharp, from the parts in their hair to the creases in their trousers. (And take it from me, sartorially, times in advertising have changed……) Now, I can’t condone the behaviour of the characters on the show, but I can tell you that this is a great “starter” look. Everything fits and everyone is fairly squared away. Ok, you think, been there, done that. Now what? You’re ready to enter the headier air of pattern mixing. Today, the absolute basic truth behind mixing it up: it’s all in the scale. 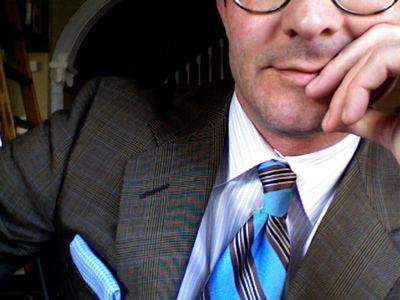 The regular stripes of the chalkstripes contrast with the wide/thin combination of the stripe on the shirt and both are alluded to by my silk knots — which appear on the solid white of the cuff. Example 2 is me in an odd jacket and trousers. So where do you start? A good rule of thumb is to start small at the center and work your way larger as you go out toward the shoulder. 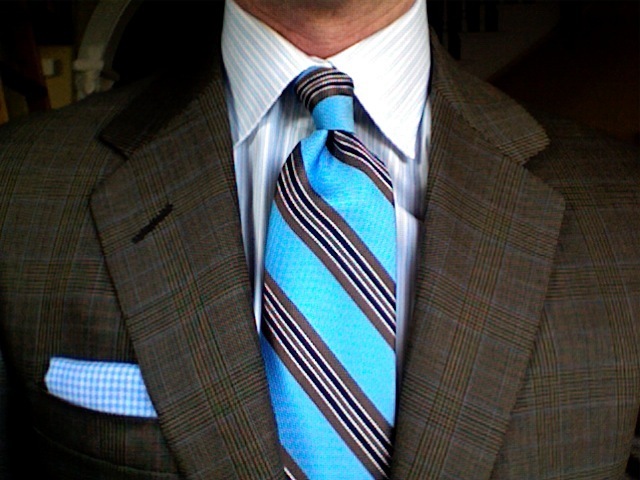 So, you may opt for a pencil stripe shirt, a medium patterned tie (slightly larger spots or a repp regimental stripe tie) a chalkstripe suit (or glen check suit) and finally, a solid color linen or a very large patterned silk for a pocket square. Far enough away from most of the rest of your ensemble, your socks are up for grabs. This entry was posted in Cultivating and tagged clothing, Cultivating, pattern mixing. Bookmark the permalink. Wow! Who knew you were such a cutie! I just have a very good tailor. Thank you, Fairfax, but I should have photoshopped out the five o’clock shadow. Or taken the picture much earlier in the day. oops, spot on and debonair! Whew! Mrs. PVE, you had me worried for a moment. I rarely start drinking before noon. Thought it might be beginning to show. ha! never drink alone! but, hey if it helps my spelling, then perhaps I shall re-consider! Heck no, Mrs. PVE, my Jack Russell, Barrymore, is a fine companion. Listens better than any bartender. WOW! 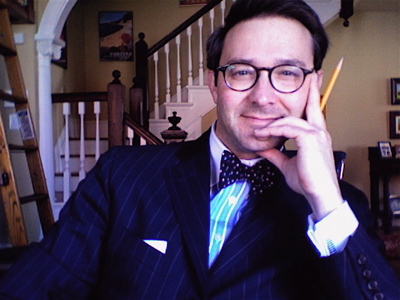 You look like Atticus Finch! TTI- It’s the glasses.. and thank you. Actually I have a lawyer friend who qualifies moreso on every level. Came upon this post whilst rustling through the archives today. faces a sinister look, wouldn’t you say.. I don’t suppose you can reveal the source~or are they “vintage”? TW– Thank you! Oliver Peoples, and they’re very comfortable, too. 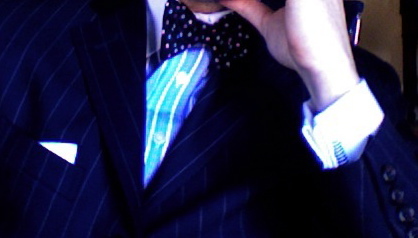 Ben Silver also sells a nice pair of Anglo-Americans and a couple of other brands.